My first experience fishing for landlocked salmon came when I was working at a camp in East Alton. Coach C and I got up early one morning in July and grabbed the Boston Whaler and headed to the mouth of Alton Bay. Coach had rigged up a fish finder and we slowly drove into the bay until we had found some fish that were schooling at 90 feet, just below the thermocline. We had our poles rigged with lead core line, leader, tippet and a Gray Ghost fly. We slowly trolled making a number of passes before we got our first salmon. With the drag created from the lead core line, it was difficult to feel the salmon on the line. When we finally netted the fish it was a beautiful eighteen inches. We fished for awhile longer getting into a couple of Lakers before we had to head in. It only took one Salmon to get me hooked. Fisherman in New England are lucky in the respect that the Northeast United States is one of the few viable habitats for landlocked salmon. According to New Hampshire Fish and Game, landlocked salmon are Atlantic salmon that have become separated from the Atlantic Ocean. Landlocked salmon are usually found in glacier lakes with deep cold water in the summer and tributary rivers and streams for spawning.There are fifteen bodies of water in New Hampshire that contain landlocked salmon, among them are Newfound Lake, Squam Lake and Lake Winnipesaukee. With fall salmon in mind, I headed up to one of the rivers that goes into Winnipesaukee. It was perfect weather to fish, so I knew there would be a large number of fishermen trying their luck. When I arrived I could see the banks of the river were lined with flyfishers. It was late afternoon as I put my rod together and tied on my orange wooly bugger and walked down to the river. A couple of guys were finishing up for the day so I grabbed their spot. They said they had some luck earlier but the salmon didn’t seem to be biting. I had heard the tales from my friends that headed up to the mecca of salmon fishing in Pulaski, N,Y. The Salmon River is notorious for big fish, if you can get them to bite. It is not unusual to hear stories of guys that go for a long weekend and catch nothing. With this in mind I started casting. 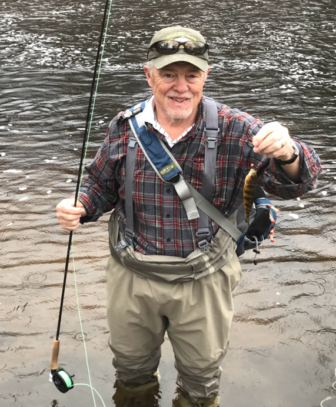 I had brought my nine foot, six weight Orvis rod which was larger than the light three weight rod I prefer for the smaller streams in the summer. It took me awhile to get used to the feel. About thirty minutes in I caught a twelve inch Rainbow. On my lighter rod this fish would have given me a battle, but it was no problem on the six weight. In fact, I didn’t realize how big it was until I had it in my net. As I was casting, I could see the salmon stacked up like cord wood vying for the spawning beds. They would occasionally come to the surface and roll, which would prompt a cast to the immediate area. After another forty minutes I thought I had my fly stuck on the bottom. I started applying pressure to see if I could get unstuck when the line started to move and the tip of my rod started to jump. I was into a big one. 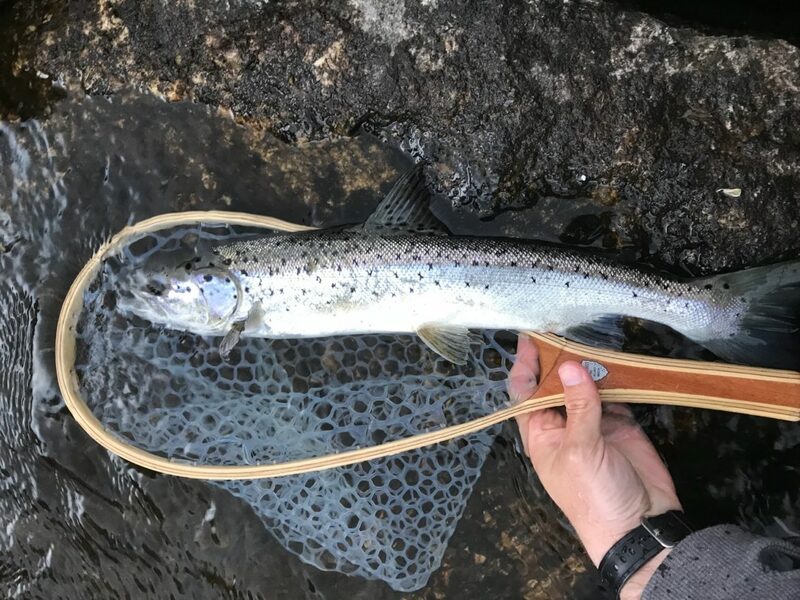 The fish started down river so I gave it some line, trying to be patient. I knew that I couldn’t muscle it in without the fear of losing it to a broken line. I played the fish for a solid fifteen minutes before I finally got it near the net. When the fish saw the net it had another burst of energy so I let out the line. Five minutes later a nice twenty inch plus fish was resting in my net. As I released the fish back into the river I had to admire how beautiful it was. I also had to admire how great it was that this river is basically in my backyard, and that I didn’t have to travel hundreds of miles and spend hundreds of dollars to catch one. I guess you could say I was living the dream.